Researching Petty Schools of 17th Century England; Surely Somebody Has Been Here Before? In researching the history of education in 17th century England, we might expect to find a number of books examining the subject in detail. To a degree this is true, but only to a degree; when it comes to petty schools, there is very little existing material and yet their activities would have affected a greater proportion of the population than any other type of school. This blog post outlines some of the sources and considers their limitations. Authors such as John Brinsley (bap.1566 d. in or after 1624) and Charles Hoole (1610-1667), both schoolmasters in the 17th century, wrote about education. In modern times, a remarkable variety of authors ranging from David Cressy to Foster Watson have written extensively about Early Modern education. In addition, many of the grammar schools that were in existence at the time have been the subjects of individual histories based on founding statutes, minute books, records of accounts and any other material the authors could find. So there is no shortage of sources to help the researcher concentrating on 17th century grammar schools. Sadly, it is a very different story when considering petty schools. Even books such as Helen Jewell’s Education in Early Modern England makes only a few passing references to them. It is true that some information exists. Charles Hoole, for example, included a treatise on petty schools in his A New Discovery of the old Art of Teaching Schoole (1660) but this deals purely with teaching methods. For example, Chapter II explains ‘How a childe may be taught with delight to know all his letters in a very little time’ (1660, p4). Clearly this would be wonderful information for anybody studying teaching methods of the time but Hoole seems to have provided no information at all for researchers interested in where petty schools were located, who taught in them, who attended them and how they were managed. 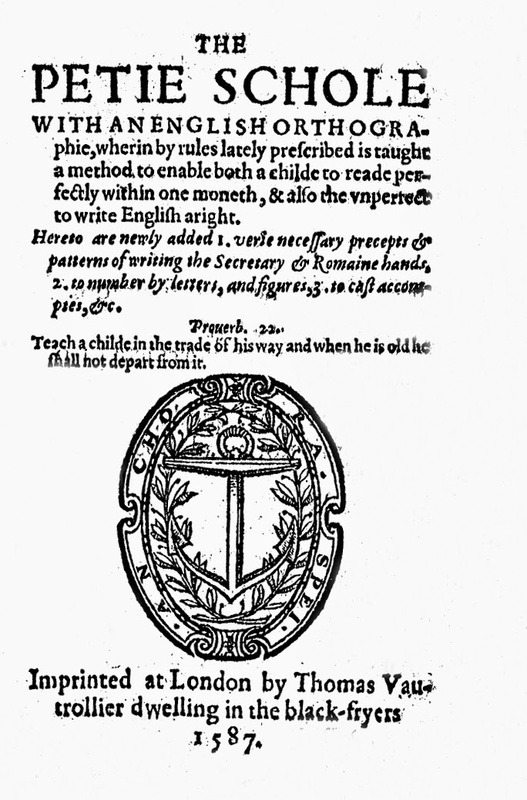 The discovery of The Petie Schole by Francis Clement, printed in 1587, offers the hope of a more informative source but, again, this contains only information on techniques for the teaching of reading and writing. Occasionally the Victoria County Histories provide a passing reference to petty or dame’s schools and sometimes a document provides a rare insight as in the case of the will of Sir Francis Nethersole who transferred buildings to a group of trustees in 1656 with the intention that a school be provided to teach boys to read and write and girls to read and do needlework. Sadly, the will provides little more information than that and there seem to be no records of the school having been built. These passing references appear to make up the bulk of available material so it seems that the only way of collecting information on petty schools is to search for brief mentions in sources such as these and biographies. Unfortunately the biographies are often confusing rather than illuminating. Adam Martindale (1623-1686) is a perfect example. His autobiography, edited by Richard Parkinson and published in 1845, made it clear that he was taught to read by his brothers, sisters ‘and a young man that came to court my sister’. When he was seven years old he started at a school in St Helens, Lancashire but he did not explain what type of school it was. At that point, he was at the lower end of the age range for grammar school and his text suggests that he was learning Latin which, in turn, suggests that this was, indeed, a grammar school given that my own researches so far have uncovered no evidence of Latin being taught within petty schools. Yet he wrote that his third teacher ‘was a woman […] that had some smattering of Latine’. In most cases grammar school founding statutes stated that a master had to have a degree which precluded women from holding such posts because they were not allowed into the universities. Yet Martindale wrote ‘She could teach us to construe the Latine examples of the English rules called the Parvular […] and Lillies rules’. It may be that she was able to do this because, according to Martindale, her father was a schoolmaster so he may have taught her some Latin (Parkinson (ed.) 1845, p12). But does this mean that she was teaching in a grammar school or that Martindale attended a petty school in which Latin was taught? Both possibilities run counter to the widely accepted understanding of petty and grammar schools. Hence Martindale confuses rather than illuminates. So where does this leave the researcher? In general terms, feeling like a prospector in the Australian gold rush: sifting through large quantities of sand in order to find the occasional grain of gold. On the other hand, the shortage of information suggests that the research is worth doing. If enough grains of gold can be gathered together, at least future researchers should have a useful source from which to work. On the other hand, perhaps there are HES members who know of better sources. If you are aware of any, please leave a comment below. Brinsley, J. (1612) Ludus Literarius or The Grammar Schoole London, Thomas Man. Clement, F. (1587) The Petie Schole London, Thomas Vautrollier. Cressy, D. (1980) Literacy and the Social OrderCambridge, Cambridge University Press. Parkinson, Rev. R. (ed.) (1845) The Life of Adam Martindale written by himself Manchester, The Chetham Society. © History of Education Society 2017.